Clothing company Mitchell & Ness has made its name on classic and retro gear. 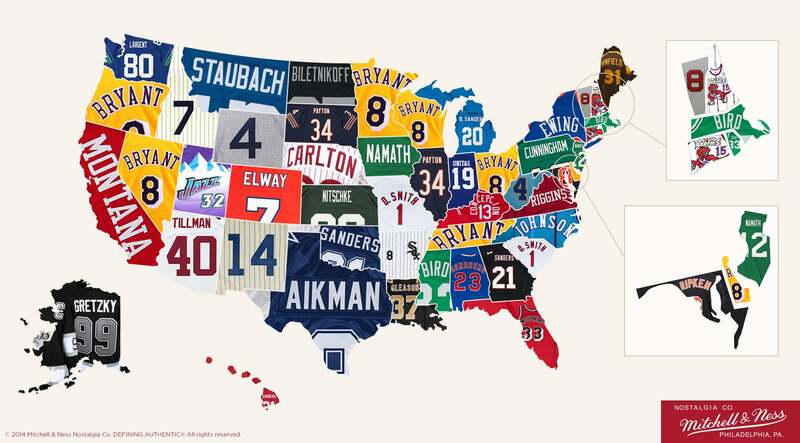 Using sales data from 2014, they've figure out which is the best-selling throwback jersey in every single state plus D.C. There are some obvious ones, but some definite surprises too. Click here for a full-size version of the image, and click through to Mitchell & Ness's site for a guide to the map, and to each state's favorites. You won't be shocked by Massachusetts's reverence of Larry Bird, or that Arizona still reps Pat Tillman, or Louisiana's love for Steve Gleason. But it's neat to see who won the states that are prolific sporting hotbeds: Aikman in Texas, Ewing in New York, Payton in Illinois, and Montana in California. It's telling to see how often Kobe Bryant shows up, in states to which he has zero connection. In each, it's his rookie-year jersey. By one measure, Kobe might be the country's most iconic athlete—but it also means that to this specific audience, he's a throwback.